The ambassadors are doing just fine! Despite the perfect work by our wonderful caretaker Betty Dorfling, we always love to spend quality time at our S.A. project (Spotted Cats Conservation) to do the care of our ambassador cats ourselves. Soon we will every day show new pictures of our gorgeous leopards, cheetahs, caracals, servals, African wildcats and black-footed cats, but now we will give you up-dates with a few pictures of our last visit (3,5 months ago). The most enthusiastic and energetic of all will always be the leopards as it seems. They never stop to amaze us. Since we decided to stop feeding any other meat than pure game meat (what they also eat in the wild), like impala, spiesbok, zebra, kudu, ostrich, etc. we can see a positive change in all our cats. They look amazingly fit and well, and they are very energetic. All leopards overwhelmed us again with lots of affection. It is so touching to see how happy they are to see we are back, and it seems like yesterday when we (only we!) enter their territory to give them some personal attention. They reward us with a typical cat-greeting (rub and hug) as also leopards do. Even though they are adult now, and even when Feline is having her moments on heat, the leopards are still all four good friends, tolerating each other and ourselves. In our care we try to give them everything they need and lots of enrichment, but they have so much pleasure to enjoy each others company and to run and play all four, using lots of space we give them and which they deserve and need. Felicia, our youngest female, after a long difficult road is so happy and healthy. She is such a loving leopard enjoying her home and her leopard friends, going from one to the other, giving them special Felicia attention (play or a grooming session). If you see this you realize this is what you wanted to achieve (for them) and that we will always keep fighting for these cats and their species to survive in their natural habitat. 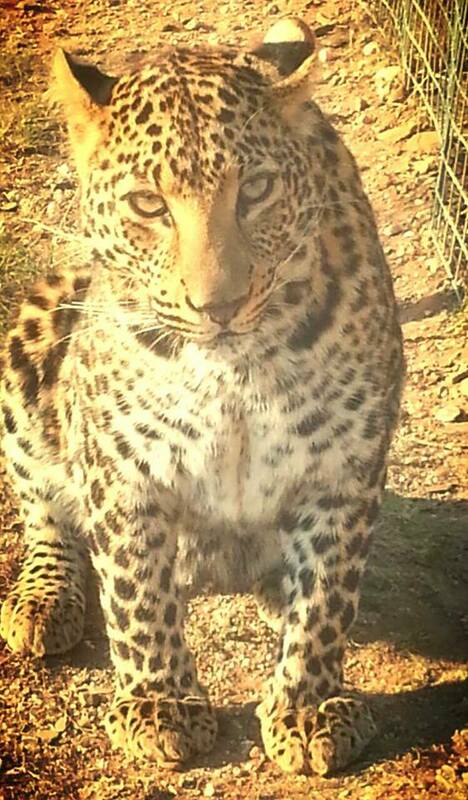 Our new male cheetah ambassador Sunny (14 months, mother-raised) finally arrived at our Spotted Cats Conservation project to join his new friends at our S.A. project. We were happy to see Speedy and Spiky again and to connect so easily again with these (semi) wild cheetahs. Speedy has grown so much, though she still has a bit of a baby face, and she is so relaxed. Spiky is really the “man” and likes to show off and protect his girl and his food, but he tolerates us close to them in his territory. They enjoy all the space in their new camps. Spiky showed great interest in his old neighbor female, cheetah Sahara, and she rewarded him with some positive attention. They are already used to the neighbors on the other side, Khaki and Thandi, and they don’t pay too much attention to them anymore. Both still have a very good appetite, their meals are very important to them and it is so rewarding to feed them the healthy game meat. Treating our ambassadors in a respectful and natural way, is paying off as the animals are so relaxed, behaving naturally, doing their own thing, but still tolerating us and our care. No stress and stereotype behavior with our ambassadors, just come and see! Our male caracal Leo seems to enjoy life with his girlfriend, DCP’s Lea. Early morning and late in the evening (night) they start running together in a playful way, during daytime they mostly are relaxing, only Lea sometimes wanders a bit thru the enclosures. Leo is mother-raised but getting more and more used to people in his territory and outside, Lea was raised by humans after having brought in as an orphan wild caracal cub (when her mother no doubt was shot by a farmer) so she is more interested in the round-abouts of humans and people visiting our project. Luckily I could rescue a sweet domestic cat out of Lea’s claws this afternoon, as her wild nature came to the surface once again, what we want of course but not affecting the less wild domestic. 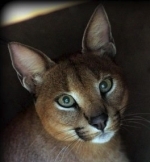 Both caracals enjoyed the springhare for dinner, Leo thought this was such a nice treat he had to bring it to safety, into his hiding place, Lea couldn’t resist to start eating right away. Let’s hope their mating will have some positive results soon, fingers crossed! Our ambassador female Joy and her boyfriend (DCP’s) Turbo were staying in our black-footed cat camps temporarily neighboring (DCP) female Spirit (“wild female”) who is living for some time now in these enclosures, enjoying the special WCW care, since the black-footed cat ambassadors moved to CCT (Cats Conservation Trust) near Craddock/Eastern Cape, S.A. Their enclosure exists of a bigger side and a smaller side when you have to separate the cats, e.g. when the female is delivering or when they need special treatment or privacy. We now decided to enlarge the ” smaller” side so they have a bit more equal space. In order to avoid stress with both servals we moved them out during this work in progress, and after our arrival we could move them back. 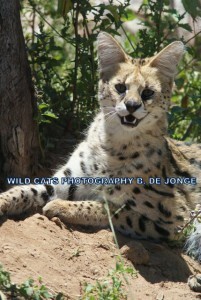 The two female servals are mother-raised but getting more used to human presence (esp. Joy) and Turbo was human-raised but due to a bad experience when he hurt his leg and had to be treated by a vet, he lost a bit of his faith in humans and also seems more (semi) wild and not ” tame”. By the tour guides they are often referred to as “not so friendly servals” but of course these three just show the true nature of a serval and a wild cat… hey hiss when they see humans, but they trust the caretaker and ourselves and are very relaxed and “friendly” in our presence, but they are allowed to hiss and behave naturally. We think you just have to respect them and be relaxed in their presence, then they reward you with the same behavior. Feeding time is very important for all three servals and they are meeting us every day very eager and enthusiastic. Very rewarding. Spirit was treated with a huge guinea fowl during the latest feeding moment and she was jumping around happily. 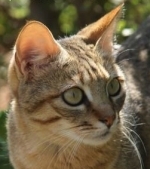 A very important species in our S.A. project is the African wildcat. So we are very happy with our two gorgeous ambassador wildcats Sid and Louise. Lots of people are more interested in bigger catspecies and see wildcats like sort of feral cats, resembling the ” ordinary” domestic cat so much, but we have to give these special cats much more credit, being the ancestor to our beloved domestic cats, but also being threatened by the domestic (feral) cats as they mate and breed with the wild cats endangering the survival of their pure genes, apart from human interference (as always). Sid and Louise seem pretty shy cats unless they know a person. They don’t want so many different people around them, but rely on and respect the ones giving great care to them. 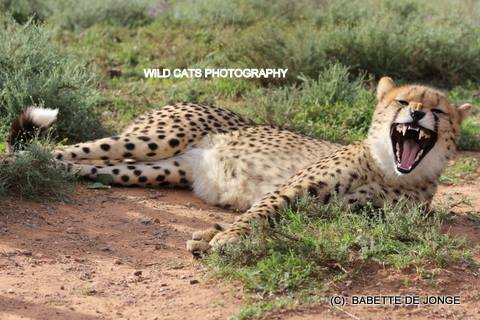 For sure they love the space they have in their new territory, and like true cats they are active late afternoon until early morning and relax during daytime, which makes them ” boring” cats to people who don’t want to invest enough time to observe them at a moment suiting them best. It is so good to see them active in the late and early hours. When we sit with them relaxed and quiet they might come so close you can almost strike them, like Sid the other day showing a great deal of interest in what we were doing. Louise has a much better appetite than her male friend, never wasting one piece of meat, trying to get some of Sid’s too. 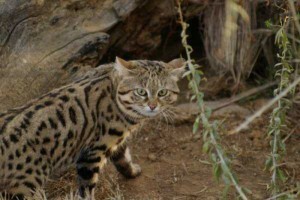 One of the most essential projects of course is the Black-footed cat Conservation Project, we first started at Spotted Cats Conservation until we decided to start working together with Cat Conservation Trust (CCT) who had great expertise in keeping, breeding and releasing this very endangered species. So we moved our three ambassadors male Blacky and females Beauty and Diva, to CCT. 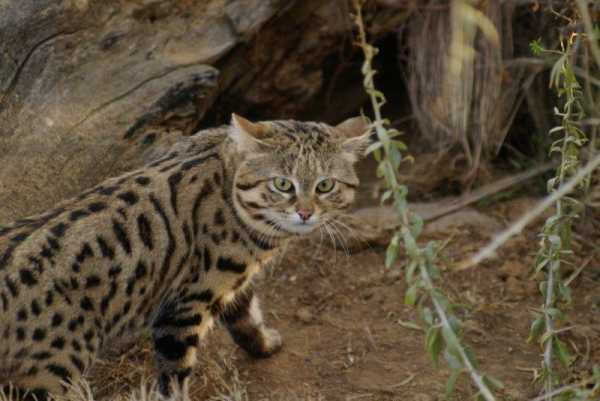 More about the black-footed cats and the project after our next visit to CCT to visit our ambassadors there, the smallest cat species of South Africa. Watch this space!